Designed for the fast ingestion of CFast 2.0 and UHS-II SDXC media on systems that support 10 Gb/s USB 3.1 Gen 2, the Dual-Slot CFast 2.0 & UHS-II SDXC USB 3.1 Gen 2 Type-C Card Reader from ProGrade Digital is equipped with a USB 3.1 Gen 2 Type-C interface and dual card slots - one that supports CFast 2.0 media, and a second that supports UHS-II SDXC media. This card reader delivers transfer speeds of up to 1.25 GB/s when one slot is being used, or speeds of up to 675 MB/s when both slots are being used simultaneously. Power is received through the USB bus, meaning that no external power sources are required, and a magnetic base helps it stay secure within your workspace. Included are a USB Type-C to Type-C cable and a USB Type-C to Type-A cable. 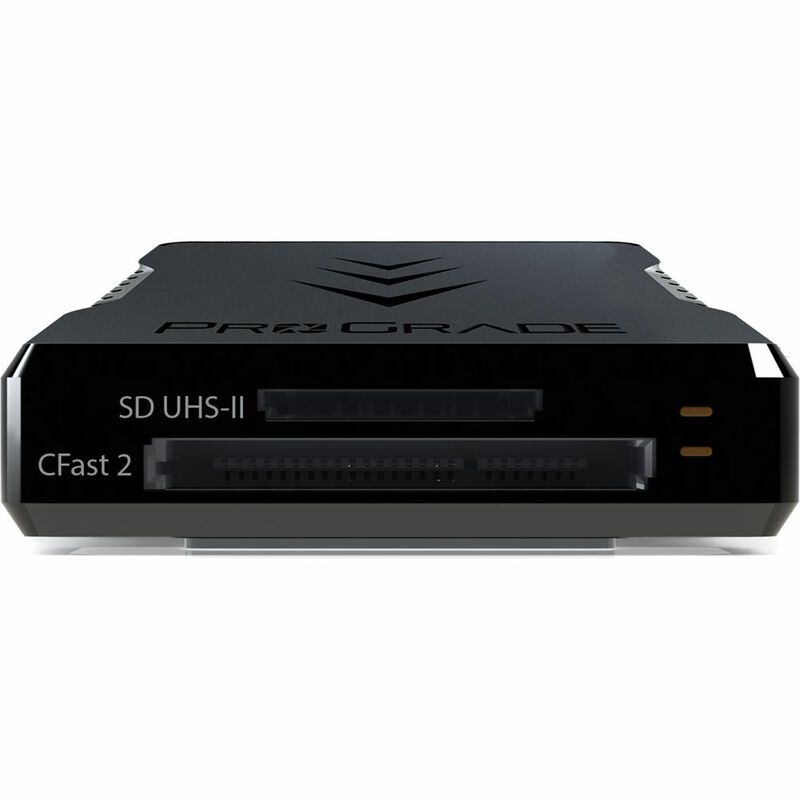 Dual-Slot CFast 2.0 & UHS-II SDXC USB 3.1 Gen 2 Type-C Card Reader is rated 4.5 out of 5 by 13. Rated 4 out of 5 by Matt Caporaso from Heavy Duty - Works as it should Used it on a couple shoots now and havent had any problems with it. Getting transfer speeds of just under 300mb/s. I'm sure I could get more if i fiddled with my HDD's and SSD's The thing is built like a brick and comes with some extra thick cables. A strong plus. Theres also a strong magnet built in the bottom which I havent found a use for yet but I can confirm it works on the fridge for safe keeping. Rated 4 out of 5 by Samuel from Works Okay One problem -- I have to unplug it and replug the USB cable in the back everytime I insert a SD card or my Windows 7.0 will not recognize the new SD card. I looked at the FAQ on ProGrades website but nothing there. I guess this is normal, but I was hoping it would work seamlessly like the SD card reader built into my laptop. Rated 5 out of 5 by Robert from Fast Works great, well built, very solid. Has a magnetic bottom, which was great while transferring photos in my friends car while he was driving. It stuck right to the corner of my MacBook Pro. Transfers are super fast. I wish it read regular CF cards but unfortunately it’s only CF Fast 2.0 and the smaller UHSII cards. Rated 5 out of 5 by Winston from Perfect pair to the ProGrade UHS-II SDXC cards Well built and good sustained SDXC card transfer rates. Awesome that it comes with two cables, one to connect to USB C host and the other for the older and more ubiquitous USB A. With the ProGrade V60 cards, I get sustained download rates of about 150MB/s. I haven't used the CFast 2.0 card slot yet. Rated 5 out of 5 by Josh from Nice kit Well built, solid piece of kit - more heft than a typical card reader. I had issues with my Lexar CF2 readers corrupting cards and have replaced them with the ProGrades. So far so good. Rated 4 out of 5 by Zachary from Fast and steady transfers This reader was a huge improvement over other readers I had, providing nearly double the transfer speed and no slowdowns. However, I am not getting anywhere near the top speeds advertised on the reader or cards. The cable is not very long, so I needed a longer cable to keep the reader at the front of my case while connected to the USB 3.1 port on the back. Rated 5 out of 5 by Andrew from FAST..... If time is money grab one of these. Various configurations are available to suit the majority of needs. Depending on your requirements you may have to buy a couple of these to cover all bases and various cards. Make sure your hardware is capable of supporting these advanced readers or you wont be able to enjoy their full potential.